The favorite. Purplish-black skin, strawberry- colored flesh, rich flavor. Heavy bearing, long-lived, large tree. Coast or inland. Fresh/dry/can. 100 hours. Self-fruitful. Large, purplish-brown figs with sweet, juicy, strawberry-red flesh. Harvest August to October in Central California. Naturally small (semi-dwarf) tree. 100 hours. Self-fruitful. Large brown skin with pink flesh. Sweet rich flavor. Naturally smaller tree, widely adapted, self-fruitful. DEER RESISTANT TREE. Delicious nut-like flavor. Golden yellow skin. Calimyrna means California version of the Smyrna Fig from Turkey. Good fresh or dried. DEER RESISTANT TREE. Purplish-brown skin, pink flesh. Widely adapted. Two crops per year - early summer and late summer to early fall. Prune to any shape. 100 hours. Self-fruitful. Highly productive, violet-striped fruit with white flecks. Richly-flavored amber flesh, resistant to splitting. 100 hours. Self-fruitful. Green skin with a sweet strawberry colored flesh. Has excellent second crop, dries well. Named after Ischia islan in the Gulf of Naples. Deer resistand tree. 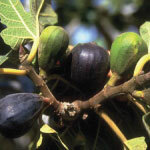 This fig ripens with a green skin, so it fools the birds that like the ripe colored figs. New "white" fig. Large, sweet, delicious, light greenish-yellow fruit with practically no seeds. Prolonged harvest, August through November at Fremont, California. Suited to coastal and inland climates. Prune to any shape. 100 hours. Self-fruitful. Large, light greenish-yellow 'white' skin, amber flesh. Long-lived,vigorous. Prune to any shape. Very sweet fruit needs hot weather to ripen. Fresh/dry/can. 100 hours. Self-fruitful. Especially fine flavor! Small to medium sized fruit, green in color with yellow "tiger" stripes. Strawbery pulp is blood-red in color. 100 hours. Self-fruitful. Beautiful, shiny, greenish yellow fruit when ripe. Very sweet, dark, amber flesh. High quality. Superb for eating fresh . Warm location with a southern exposure is required for ripening fruit in maritime Northwest. Originated in Sicily. Good cold tolerance. Zones 6-10. Small to medium size purple-black fruit with a very deep red strawberry pulp, a distinctive sweet rich flavor. Brebas are pyriform with a thick, tapering neck; main crop figs are variable often without neck. Medium eye. Excellent fresh or dried. Breba crop, hardy. Good for container culture or small spaces. Zones 5-10. Old variety, a favorite in cool coastal areas--also excellent inland. Greenish -yellow skin, amber flesh, distinctive flavor. Prune to any shape. 100 hours. Self-fruitful.